Lately I've been so consumed with decorating and finding a (very specific style) coffee table that isn't obscenely wide. I haven't given much thought to clothing or shoes, what I'm going to wear in the morning, or what new things I might like to add to my collection. Who am I? What am I? Where can I find nyc apartment sized furniture? There are so many questions. But in my summery daydreams where all the trees are in bloom I'm wearing something like this. 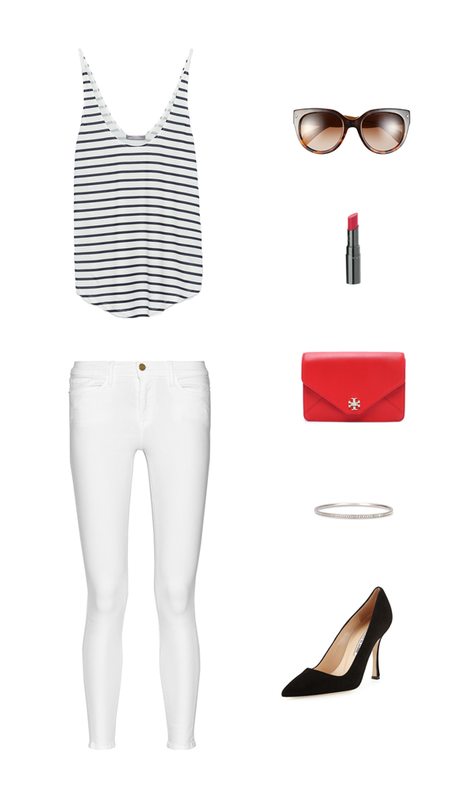 Clean white jeans with a loose striped top that dips down a little in the back. It's the kind of classic and simple outfit you could wear just about anywhere. Slip on a pair of sandals for a walk in the park or some suede heels to head out for drinks. Obviously my mind is set on the happy hour portion of the day. I've been eyeing these heels for too long and if it is socially acceptable to wear suede to a June wedding, I just might have to (finally) scoop them up. One of these days things will bloom. The way I've been eyeing the tree outside my window, well maybe I'd hold off on growing leaves too. OMG I can't even deal with how perfect EVERY detail of this outfit is. I love everything about it and I need that tank in my life ASAP! I've been looking for the perfect pair of cateye sunglasses and those are so amazing! Yes! Love everything about this look! So clean and fresh! Perfect for summer! I can't wait for tank top weather! Such a great outfit you put together! Love this! I need that top! marvellous collage, love the sunnies!! !